During qualifying time-trials at the 2009 World Ski Cross championship in Inawashiro, Japan, Canadian Ashleigh McIvor took a turn too tightly and hooked her ski on a gate. During qualifying time-trials at the 2009 World Ski Cross championship in Inawashiro, Japan, Canadian Ashleigh McIvor took a turn too tightly and hooked her ski on a gate. She flew down the hill end-over-end and landed in a heap, stopping almost at the bottom of the course. "I just started hiking up the hill as fast as I could," McIvor said. "Got back up around and through the gate and finished about two minutes off the leader." Two minutes off the leader but, amazingly, good enough to qualify. McIvor was seeded at the bottom — 28th out of 28. It meant that for each race, she had the worst starting position, far off the best lines of the course. If she was going to succeed, she needed a bold strategy. McIvor consulted her coach, Eric Archer, and he had a suggestion. "Her and I had talked about one spot on the course where they were coming off the top flat onto a steep pitch, and I'd noticed that all the girls were really setting that up high," Archer said. "I just said 'Ashleigh, this is going to be open every round. If you're behind, go straight, cut off the line, and you'll make a pass.' And every heat, she made a pass there, including in the final." The tactic worked, propelling McIvor from the lowest qualifying position to winning the world championship and an Olympic berth. 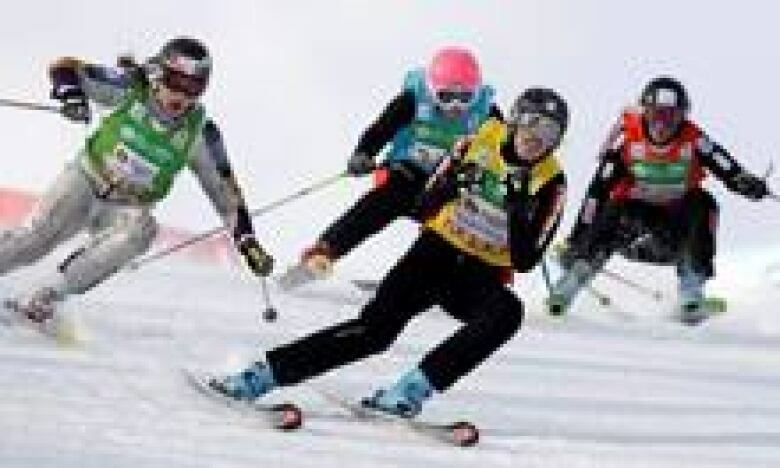 McIvor, front, became interested in the sport of skicross seven years ago. ((Lee Jin-man/Associated Press))Five years ago, McIvor, now 26, never expected she would be heading to the Olympics. Not because she wasn't one of the top athletes in her sport but because skicross wasn't an Olympic sport. Much like motocross or its snowboard-based cousin, boardercross, skicross has four athletes race simultaneously down a course of turns, jumps, moguls and other obstacles. The two fastest racers move on to the next heat, until the final, when the medals are won. Boardercross was added to the Olympic menu at the Games in Turin, Italy, and proved to be wildly popular with fans. The electrifying action on the slopes caught on quickly and the sport became the darling of the 2006 games. In November 2006, skicross was added as an Olympic sport without having a demonstration period, based solely on the strength of boardercross's popularity. It helped that skicross would use the same course as boardercross, meaning no additional venues or set-up would be required. McIvor got interested in the sport in 2002. "I saw skicross on the X-Games and I thought 'You know, I can compete with those girls,' " she said. "I had some friends who I was skiing powder with and they convinced me that I could do it." Fired up about skicross, McIvor persuaded her mom to drive with her from Whistler, B.C., where she lived, down to Lake Tahoe, Nev., in January 2003 for an X-Games qualifier. She dominated the competition and easily made the final. "I had mixed feelings about the trip because I knew skicross was a dangerous sport and the last thing I wanted was for her to get hurt," said Ashleigh's mother, Marilyn McIvor. "I wanted to support her, and I was available to drive down with her, and it was on that trip that I realized what an accomplished athlete she could become." Marilyn wasn't the only one to take notice of the budding skicross superstar. It was at Lake Tahoe that sponsors began approaching. McIvor's career in skicross took off, culminating in a world title. But now, with skicross an Olympic sport, McIvor is mentally preparing herself to take it to the next level. "I'm different from most people," she said. "I don't like to be uber-focused. I like to just have fun with it and try to convince myself that it's just another race with a bunch of friends. I don't like to put too much pressure on myself." Although her approach is laid-back, her goal is clear. "Her goal — that she has written down — is a gold medal," coach Archer said. "We went through with each athlete what their goal is for each event and for Ashleigh, it's a gold medal at the Olympics." McIvor considers her top competition to be Ophelie David of France, who has won the World Cup championship six times. When McIvor won at Inawashiro, however, David finished seventh. McIvor's dedication and experience make her the likely choice to win the first-ever Olympic gold medal in women's skicross. ((Katsumi Kasahara/Associated Press))The rest of McIvor's competition is familiar — they're her Canadian teammates. Kelsey Serwa, Julia Murray, Danielle Poleschuk and Aleisha Cline are all considered threats to reach the podium. But Ashleigh's dedication and experience make her the likely choice to win the first-ever Olympic gold medal in women's skicross. "Anytime the defending world champion is coming to an event, she has to be considered a favourite," Archer said. Competing on Canadian soil, near her hometown of Whistler, is another advantage for McIvor. She has often skied the Olympic course at Cypress Mountain and knows its peculiarities. Last Feb. 5, McIvor finished second to Serwa in a World Cup race on the course. "Racing and having friends and family at the bottom of the course, it will feel like we're racing with all of Canada behind us," McIvor said. "Having the hometown crowd makes a huge difference. "I think that's why we did so well in the World Cup event at Cypress Mountain [in February], winning five of six medals between our men and women's teams — that hometown charge."